Here is my new print, it's another piece of a bigger painting. Sorry for the short post, watching Asher while his mommy unpacks in thier new condo. I'm in a 2010 Calendar! 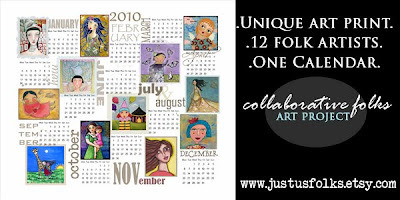 Ann Gardner has put together a 2010 art calendar and my Lempicka/ Klimt girl is January! Here is this weeks print. It's a piece of my new painting. We had a great time on Lopez island, with our friends, Ken and Jeanette. Many delicious meals were cooked and eaten, we explored the island and talked and talked. Very relaxing and fun. We are leaving this morning for a little weekend+ getaway with friends to Lopez Island in the San Juans. We'll be back Monday afternoon. I don't think we will have internet there, so I won't be able to post the week 32 print until Monday or Tuesday. To tide you over, here is a picture of my latest painting. It's 30x40" acrylic, called Botanical Serenade. It's part of a show I will be having at Circa on California Ave in West Seattle. The show will be hung on December 1st and run through the month. Skylar picked Michele P and Miz Katie! Please email me your addresses and I will mail your prints out. Thanks to everyone who commented, we are all feeling better, over our colds. I totally forgot to post my print last night and do the giveaway drawing. I am so sorry! I was babysitting Asher and I just completely forgot! 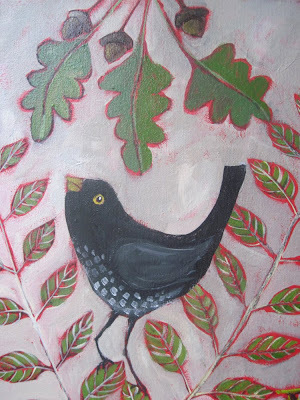 Anyway, you can buy the new Hortense print on etsy by clicking on her picture. If you want to enter the giveaway, leave a comment on the giveaway post below. Skylar will draw two names at 6pm and I will announce two winners who will each recieve 4 5x7 prints. We have some colds in the Fillo house this week, so I am taking the lazy way out and using an older painting as my print for this week, but I redid her face so it feels kosher. I will not be able to post it to etsy until tomorrow, as I was holding sleeping Asher when I should have been taking pictures while it was still light. I will post better pics tomorrow. The print is called "Despite Advice From What Not To Wear, Hortense Feels Confident In Horizontal Stripes"
I am also going to give away 2 sets of prints this time as I did not do it last month. I just spaced on it, for some reason. Leave a comment here to be entered. Skylar will choose the two winners on Sunday next.I'm also including a short vid of Ash crawling for the family. 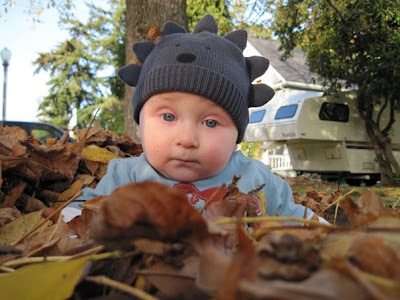 Asher is 7 months, and he has been described by several people 'in the know' as a GOER. He is crawling, can pull himself up on furniture, and last night pulled himself up on my laptop stand and was literally hanging from it by his little fingers. We are in for it, I'm thinking. This picture was taken two weeks ago, before the leaves were soggy. I'm sorry I have not replied to your comments, my friends, I am losing a dear friend who is in hospice and there is other assorted drama going on, plus two little boys who keep us hopping. I am a little better about replying on facebook, so if you really want to talk to me, look me up on facebook, Julie Fillo. Or email me at juliefillo@hotmail.com. My son, Ryan and his wife, Kim, just spent a week in October seeing fall colors on the east coast. They are currently visiting here in Washington, but they are calling Patterson, NY home right now. This is a painting requested by Ryan, as he saw all sorts of cool whale folk art in Nantucket and said I needed to paint a whale. 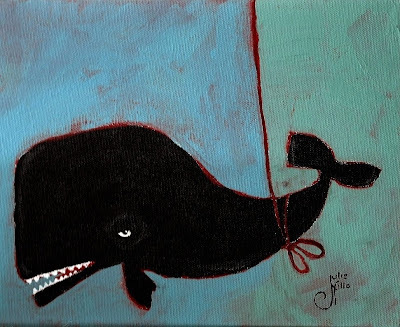 Since I am currently obsessed with painting things on strings, this whale is on a string and he does not look so happy. This one's for you, Ry.